We recently held a Dial West Cheshire Awareness Day in Ellesmere Port. 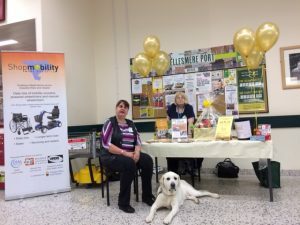 We sent a team of our beaming volunteers (including Yaris, the guide dog) to Morrisons to meet and greet shoppers and spread the word about all the wonderful work which Dial West Cheshire does in their community. 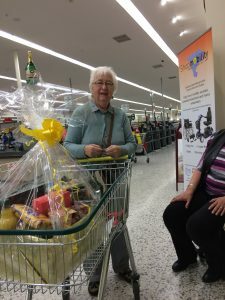 Kindly aided by the team at Morrisons, our team ran a bucket collection at checkout points and tombola at the front of the store where a fantastic hamper was up for grabs amongst other prizes. The winner of the hamper was a lovely lady who had never won a prize before and was very excited to take such a lovely prize home. The day was a roaring success with £176 raised for Dial West Cheshire. We would like to say thanks to our team of volunteers for running such a fantastic event for us, to the shoppers of Ellesmere Port for your generous donations, and a special thanks to Michelle Smith, Morrisons Community Champion, for hosting our charity and being so helpful on the day. Alternatively, if you think your workplace would be a great place to host a Dial West Cheshire Awareness Day, please, get in touch with our fundraising team here.